Fresh from Woolie’s Workshop is a Tang-Tang’n 2-stroke with capabilities of extremely high engine revolutions per minute and enough squeeze-pop to make your head spin. This 250cc Yamaha 2-Cycle racer looks fast standing still and is a unique personal project of Venice Motorcycle Design Director Michael Woolaway, who built it to be competitive in the 250 race class. 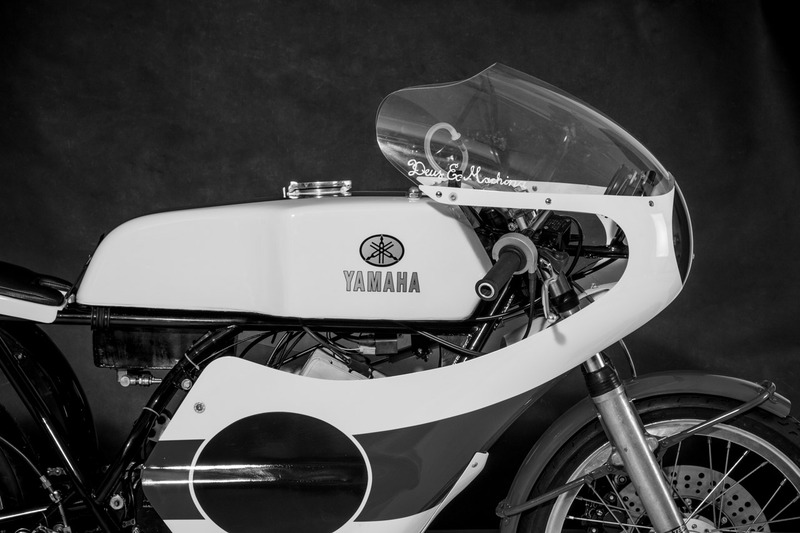 Yamaha TZs are the stuff of legends in the race world, winning international Grand Prix races throughout the 70′s. Like all the builds out of Woolie’s Workshop, it has that ‘final 5%” which is always the most assiduously earned and separates the great bikes from the good ones. This race-spec steed is feather-weight and fed by twin Mikunis to produce 50bhp @ 10,500 RPM’s. Tuck in, hold on, and safety-wire your bum to the seat cuz this little two-smoker is a real zinger!